First of all, I want to say it is so much fun drawing for you all. Your likes and comments encourage me, your blogs inspire me, and you make me feel like a million bucks by simply clicking on my site. So thank you! This blog is indeed keeping me creating every day, no matter how busy it is at home or in the office. Decided to change it up a bit tonight and work on the human form for a bit. I want to thank my local arts alliance for bringing in live models, or I’d have never had the courage to even try drawing humans, or even anything with fur, for that matter! I thought for sure it would be a disaster, but I learned that drawing the form is like drawing anything else: look for the tonal values and shade, shade, shade. It seems to be the key to everything. For me, anyway. I’m lucky to have a very patient husband who is happy to be my live model. I’ve always admired his hands, and so it’s a pleasure to draw a bit of them tonight. I have to say, I’m not thrilled with this one. I know hands are hard, but I chose the pinkie finger, which was probably the most challenging, because it was curled away from me in the photo. Nice view of the knuckle though! But there’s much more of a curve to his outer finger in the photo, and it’s not long enough. And lots more things. Focusing on the goal, which is to improve…at least I learned that I need lots of practice with hands. I’m determined to get them figured out, though. Maybe by this time next year. 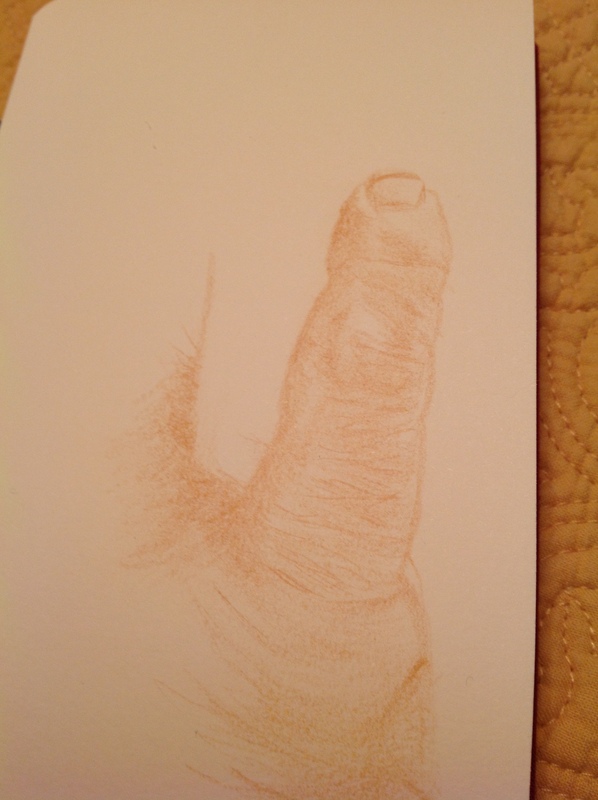 A Polychromos pencil in burnt ochre, and my 3×5″ HandBook sketch pad helped me out tonight. I look forward to your posts and what you will draw! Keep up the great work! Aww, thanks Jodi! I look forward to yours too! 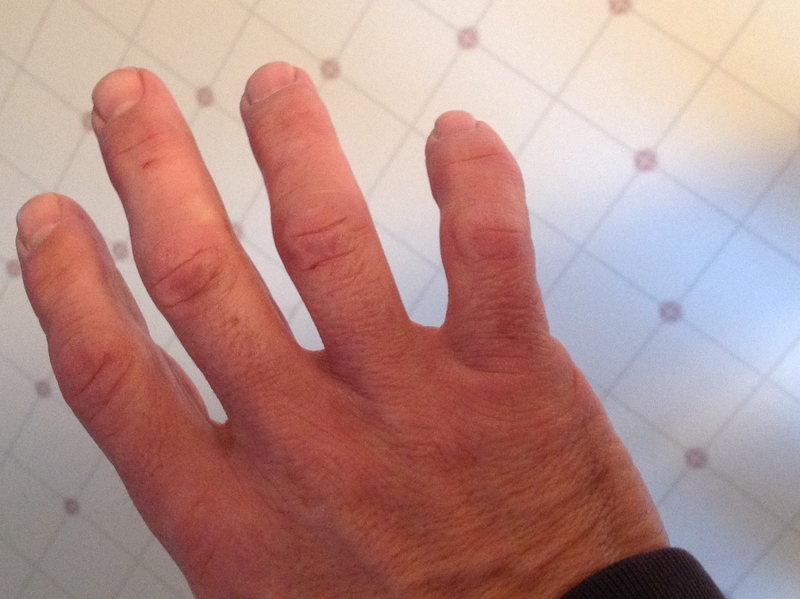 L, great job on the knuckle! I’m so excited what Art is doing 4 U! I have heard that it is hard to draw hands, I suppose each hand is unique and filled with details. Very true, and often what you expect to see is not what’s actually there. This is what I have to keep telling myself when I’m drawing. Draw what you see, draw what you see.